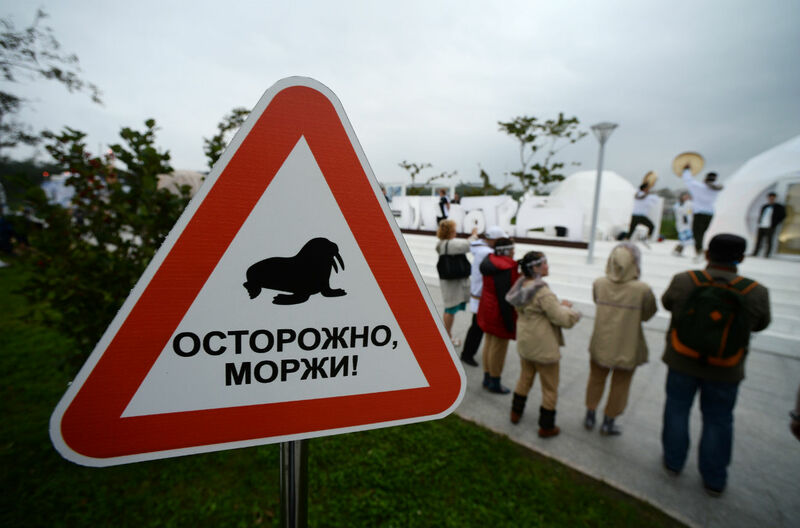 The sign "Caution, walruses" was placed in the "Chukhotka" Pavilion during the 2016 Eastern Economic Forum in Vladivostok. The Pacific Ocean walruses are an integral part of the population of the Chukhotka Autonomous Territory. Not all road signs in Russia conform to the Vienna Convention on Road Signs and Signals. Activists or art groups may erect some. Others relate to animals or thanks to literary works. Sometimes the signs indicate social responsibilities. RBTH lists a selection of the most amusing traffic signs - official or otherwise - from across the country. A sign reading "Caution, walruses" was placed in the "Chukotka" Pavilion during the 2016 Eastern Economic Forum in Vladivostok. Pacific Ocean walruses are native to the Chukotka Autonomous Territory. Olkhon is the largest island on the world's biggest lake, Baikal. In the winter, when the lake freezes solid, traffic lanes are set up across the ice, with warning signs stating "Permissible car loads - 5 tons," "Recommended speed - 10 kph (6mph)" "Stopping forbidden" and other cautionary words are put up. A sign reading "Caution, Pokemon catchers!" appeared in St. Petersburg at a downtown location where many characters from the mobile telephone game Pokemon GO were to be found, attracting many players. Authorities were swift to remove the sign. A warning "Caution, zombies!" that appeared in Moscow at the Sokolniki Exhibition Center warns drivers about pedestrians who cannot take their eyes off their mobile phones and other hand-held devices even while they are walking. Moscow Agency. "Caution, squirrels!" is a warning sign on the Sverdlovskaya Embankment in St. Petersburg. The familiar small rodents are often spotted in the surrounding area. Yes, Russia has its own Paris. It is a village in the Nagaibaksk District near Chelyabinsk in the Ural region. The Russian Paris boasts its own Eiffel Tower, which was erected in 2005 and functions as a cellular network tower. Unusual road signs with images of animals on yellow reflective plaques appeared in Barnaul last year. The idea is to make drivers aware of the consequences of violating traffic rules. Those who do not follow the rules are compared to goats and sheep. The sign "It is forbidden to talk to strangers" at Moscow's Patriarch Ponds appeared thanks to Russian writer Mikhail Bulgakov's famous novel The Master and Margarita. The sign shows the novel's characters: The devilish Woland, Koroviev and a cat called Behemoth. Read the first chapter of the novel, which takes place right there at Patriarch Ponds, and you will understand why the sign is necessary. In St. Petersburg the Yav art group has put up alternative signs with slogans to help motivate people. This sign "Pump your brain" is located in front of the Russian Museum. Such a sign will never be encountered on public roads. The sign "Caution, tanks" is seen during military drills on firing ranges or during military technology exhibitions.